I’ve read this graphic novel from 2010 only now because, to be perfectly honest, I had no interest in it when it was first released. I’ve read a lot of retellings and re-imaginings of Superman’s origin, and it seems like there’s been a lot of them in the past decade or so. 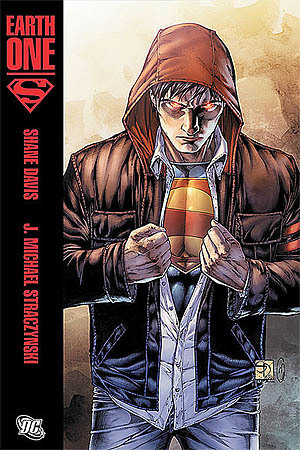 On top of that, I didn’t care for the tone of the cover image: I had no interest in a brooding, laser-eyed, hoodie-wearing Clark Kent. Eventually I got over myself and decided what the heck, it’s J. Michael Straczynski – how bad could it be? I became a fan of Straczynski’s because of his often ground-breaking mid-’90s science fiction tv series, Babylon 5. I first noticed his approach to examining and rejiggering origin stories during his run on The Amazing Spider-man (starting in 2001) and when I read the proposal (available online at http://bztv.typepad.com/newsviews/files/ST2004Reboot.pdf) he wrote with Bryce Zabel for a tv-series reboot of the original Star Trek series. What I like about his approach is that he looks at the established facts of said origin or back-story and asks “why?”: Why did the spider bite Peter Parker? Why did the spider bite Peter Parker? Why are so many of Spider-man’s enemies animal-themed, like himself? Why was the Enterprise sent on a 5-year mission? Why a 5-year mission? Why is there only one alien aboard? Why is that one alien a Vulcan? Why is that Vulcan specifically Mr. Spock? You get the idea. This approach is a strong one when taking on the task of re-examining the roots of a setting or character. It opens up lots of doors, creating new opportunities for stories and depth. I dare say Spider-man is too “light” a character for this approach, but it definitely has its uses. The thing is, the answers to these “why” questions need to be well-integrated into the story-telling. A clever answer to an insightful question is only kind of interesting if the characters stand around and explain the new idea, and Superman Earth One almost overflows with just that. There’s nothing wrong with JMS’ story: he hits the important Superman origin story beats and introduces all the important characters in ways that express what those character are all about. Unfortunately, most of it is pretty ham-fisted. The old rule in storytelling is “show me, don’t tell me”, but JMS feels the need to have his characters tell us nearly everything. For example, coming up with an explanation of why Krypton exploded, and why it did so suddenly, is a really neat idea, but having the villain explain it at great length in very large word balloons is not. It gets worse when the explanation hand waves and glosses over details that really need to be addressed for this new insight to be satisfying. If this were an ongoing series, I’d assume that the details would be addressed in subsequent issues, but that would also require some indication that they will be addressed. There are many ways to indicate this, such as having a character wonder about one or more of these details and saying something like “I’ve got to find out!” There’s drama in that. There’s no drama in me wondering why all those curious details aren’t even referenced – by anyone. That’s just frustrating. There are several scenes that fall into the trap of the “In Theory” trope ( http://tvtropes.org/pmwiki/pmwiki.php/Main/InTheory ), wherein characters come up with explanations for the strange thing that’s happening in the scene and hey, what do you know, the story has to move along so they’re assessment is accurate! The story then proceeds with their theory being true. This trope seems to be popping up more and more in popular media, and its starting to really bug me. The chief way to reveal character in a story is to show us how people behave when their attitudes, plans, theories, and the like clash with reality. There are very few of these sorts of twists and turns in this story, so the whole thing feels like an exercise in getting to the climax so the “neat ideas” can be revealed. Another pet peeve: there are many scenes wherein characters explain their own or another character’s emotions and motivations. I have a simple rule when it comes to reading, a simple request I make of writers: just tell me a story. Once characters start talking about what they themselves or another character stand for or are all about, you are no longer telling a story; you are telling me about your characters and how cool they are. Speaking of characters, JMS introduces a couple of new ones to the traditional Superman milieu and they’re both smart choices, I think: a government-employed female scientist works to crack the mysteries of a piece of alien technology, and a powerful male alien with giant spaceships wants to finally complete his mission in life. The scientist nicely focuses into one character the interest any government or powerful organization would have in alien technology. The alien’s background is nicely woven into Superman’s origin, but the schemes he and his people perpetrated make sense only in a dumb, action movie kind of way and beg far too many further questions that, as mentioned above, never get answered or are even addressed. In terms of the art, binding, trade dress and design and the like, it’s an attractive book. Shane Davis is good, although his anatomy is a little off here and there. I’ve seen better work by him, so I don’t know what to attribute that to. He’s not quite up to some of the demands of the story, namely designing alien technology and laying out dynamic action scenes. Just a little more liveliness and imagination would have gone a long way there. Sandra Hope seems a good match for Shane’s pencils. Barbara Ciardo’s colors are rich and moody, but in some places that approach keeps the story from opening up, visually; everything seems to be happening at sunset. On the whole, Superman Earth One held my interest enough that I finished it in one sitting. I liked it more than I expected to. If you’re a Superman fan, it has some tasty meat on it’s bones. JMS’ heart and mind are in the right place, and he explores and has some intriguing and even exciting interpretations and insights regarding characters, relationships, and events in the traditional Superman origin story. However, a cannier, more subtle and layered approach would have greatly benefited the whole affair. Superman: Earth One doesn’t live up to the hype or needs of a modern, bold retelling for 21st century mass audiences of the Man of Steel’s origins.